Who’s excited for this? Each week on Tuesdays and Wednesdays, there are two family-friendly movies that you can see for only $1 each at Regal Cinemas. Each week both movies play on both days. Tickets will be available at the box office and all movies start at 10am. A portion of the proceeds goes to the Will Rogers Institute. If you love camping, hiking, tailgating or any other kind of outdoor activity, you have probably ended up in a situation where you didn’t have a place to sit except for the ground a time or two. While this may be fine for the younger folks, it might not be ideal for some of us who, (to put it politely) just aren’t spring chickens anymore. 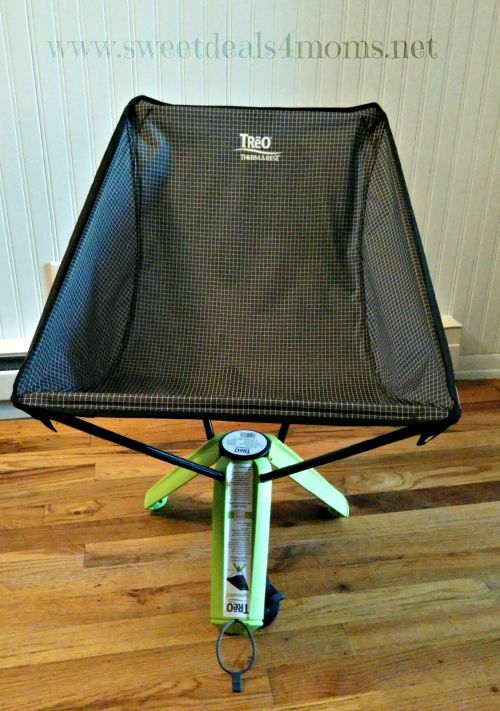 If this sounds like you, you might want to check out the Treo Chair from Therm-a-Rest. You might not believe it, but there is a chair in this little plastic pod. In fact, it is a part of the chair. As you can see, it has an integrated elastic band which secures the chair closed and a carry handle for easy transport. It’s small enough to pack in a bag or backpack too if you’d prefer. When you open the pod, you will find these pieces inside. Obviously, these are the parts you need to complete the chair. This can be accomplished in just a minute or two. It’s very similar to putting together a small tent. This is the finished product. I really love the style. It’s got a nice overall look to it. It’s also very comfy and sturdy. The chair sits at 13″ high so that you can get into it easily and believe it or not, this chair supports up to 250 lbs. As you can imagine, this chair is a huge hit at our house. The kids have been “taking turns” using it, but I will get it packed up soon and most likely will keep it in the car to have on hand for a spontaneous adventure. Yes, my spontaneous adventures do involve sitting at times (ie: trip to the beach). 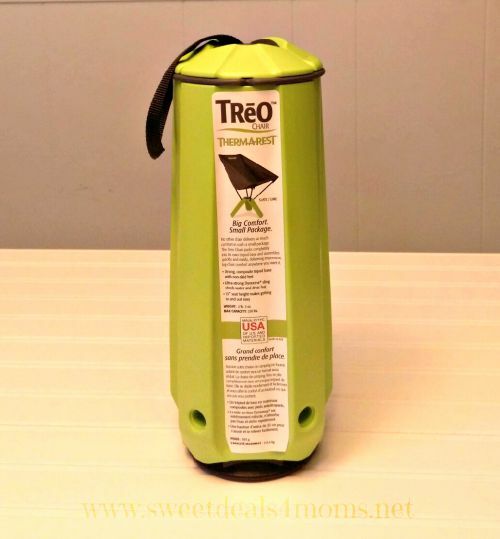 Buy it: If you have alot of outdoor adventures, you might like to have a Therm-a-Rest Treo Chair on hand. 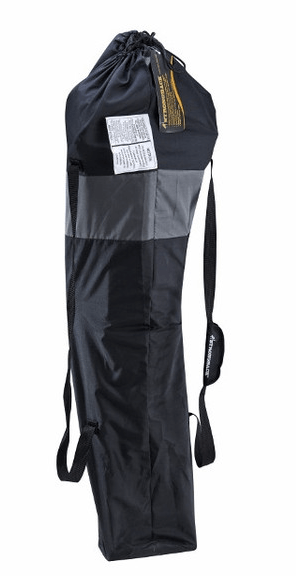 You can get one as well as other outdoor products from Therm-a-Rest. Disclosure: I received free product as part of this review. All opinions stated are my own. 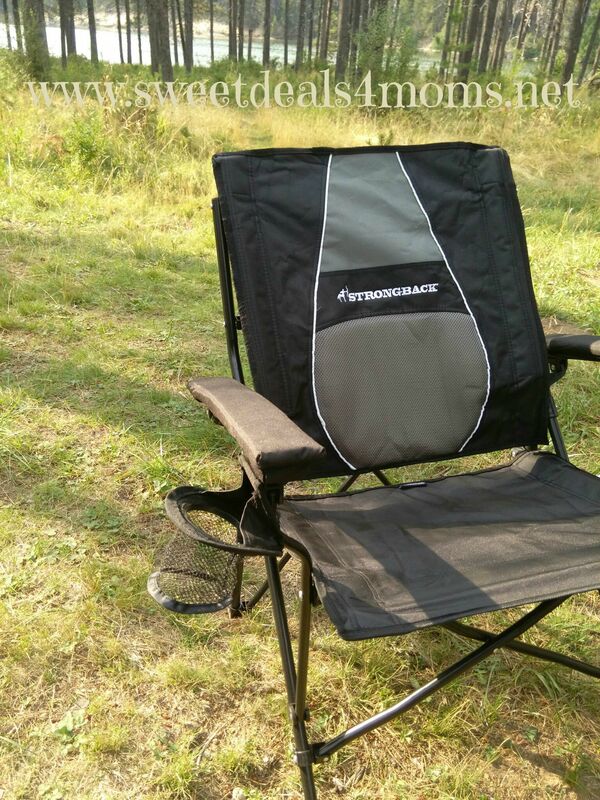 If you like to hang out in the great outdoors, but you also like to be comfortable, the Strongback Elite is for you. With it’s exclusive frame integrated lumbar support, you get superior support and comfort while at the same time, the portability you need. I received a Strongback Elite chair recently so that I could try it for myself. We took a camping trip a couple of weeks ago, so this was a perfect opportunity to try it out. 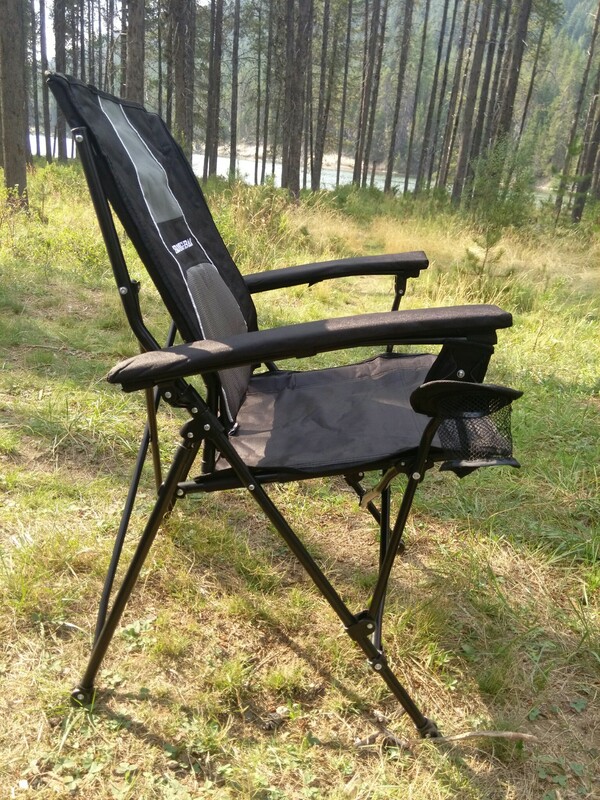 We do already have a couple of folding camping chairs, so I noticed right away that this chair, while it does fold up easily and has it’s own carry bag (with convenient dual shoulder straps), is longer than my other chairs when it’s folded up. Let me tell you though, it was worth taking up the extra room in the car to bring it, because it is very comfortable. Much more so than our other chairs. In fact, I found my kids and my husband in this chair a lot. I had to sneak in half the time when they were distracted and off of their seats. This chair features padded armrests, which are super comfy. As you can see from the side, there are a lot of folding parts, but they are simple to fold up and open. There’s really nothing to it. It’s also super sturdy. The ergonomic seat design allows you to relax against the comfortable lumbar support on your back while preventing the uncomfortable leg-pinch from the fabric in the front of the seat that is common in many other chairs. Another nice feature is the cup holder. While this is not an uncommon feature in a portable chair, I like the way that this particular one is made. It just sort of folds up and down really easily. There’s no swivel or anything to complicate it. I think that is the overall theme of this chair: simplicity. I love it and will use it every chance I get. 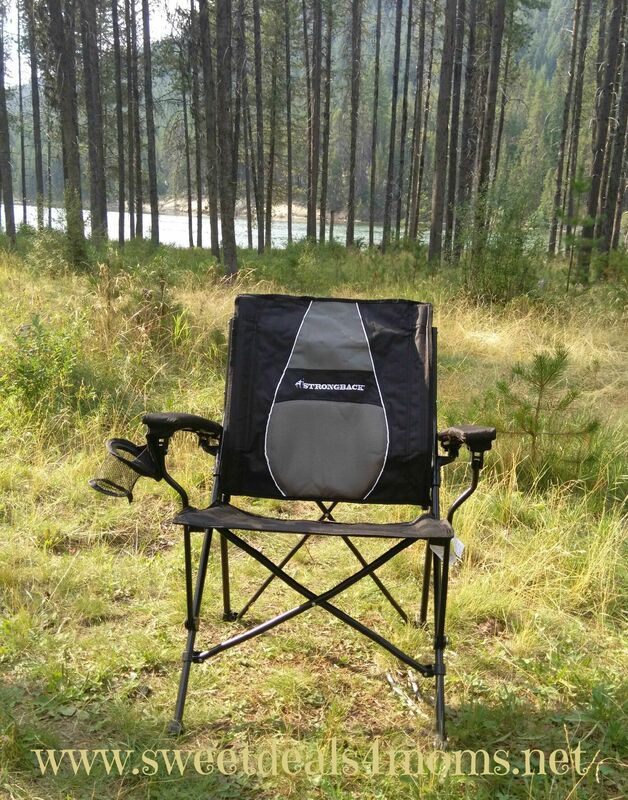 Buy it: You can get your own Strongback Elite Portable Chair online. As a reader exclusive, you can get 15% off with code SweetDeals2015. If you are looking for a fun activity for the kids to do indoors aside from looking at a screen, check out the Sands Alive! Glow Starter Set. We received a kit so my kids could try it out for this review and they loved it! The kit is very straight forward. 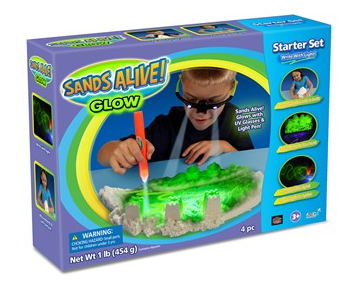 You get 1 pound of GLOW Sand, UV LED Glasses, UV Pen Light and a Play Tray, which I was really grateful for. It says on the box that it’s geared for ages 3 and up, but I can tell you that all three of my kids were interested in it and my oldest is 12. I literally had to give them turns which I timed in 30 minute intervals. 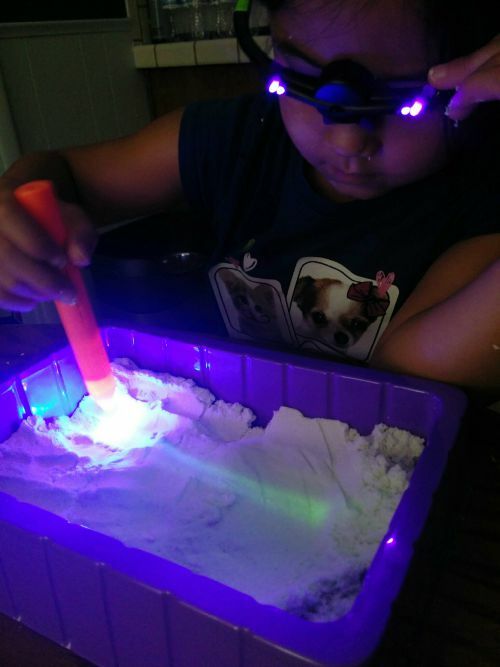 Here you can see my daughter playing with the sand with her cool UV LED Glasses and UV Pen Light. You can see how you can pretty much write on the sand with the light adding to the coolness factor by about 80%. So you all are probably thinking I am crazy for letting my kids play with sand in the house, but I have to say it’s not exactly sand. It’s more of a fluffy, soft dough which can be formed into different shapes and stuff. Yes, it can get messy, but so do most creative toys. You just clean it up and move on. Buy it: Interested in keeping your kids entertained for hours of creative play? Give Sands Alive! Glow a try. Click here to find out where to buy it near you. I hope all of your summer breaks are going well so far. The kids and I have been keeping busy and have been trying to spend as much time outdoors as possible, but it’s been SO dang hot that it kind of forces us back indoors. I’m talking in the 90’s everyday hot! 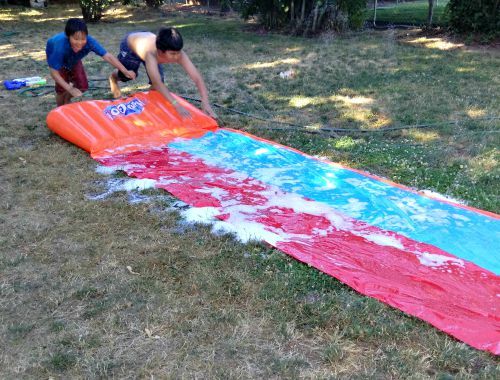 One of the ways we have found to deal with the heat and still get the kids outside is with H20Go Water Slides. 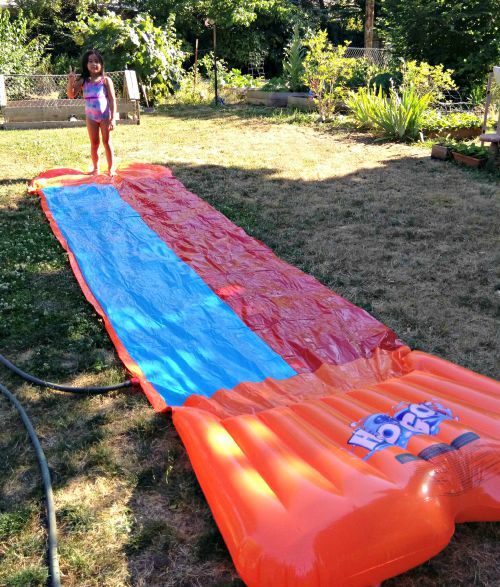 From the Triple Slide, to double or single, there is an H20Go Slide to meet your needs. These are super fun and easy to set up. 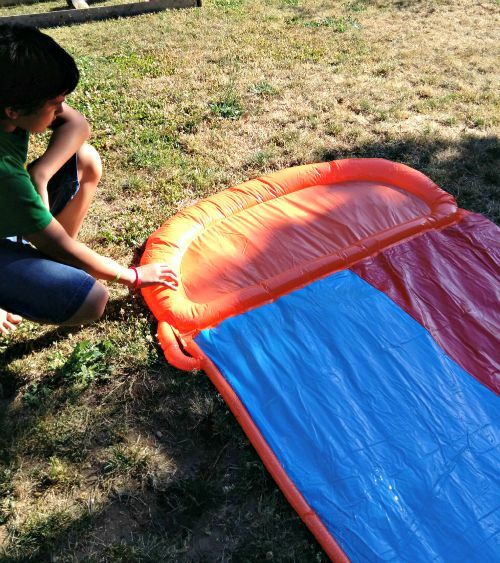 The speed ramp provides a soft landing and glides the kids onto the slide for a smooth ride! The ramp does require a bit of air. It would be challenging to fill it yourself. We used an air compressor and were done in one minute or less. 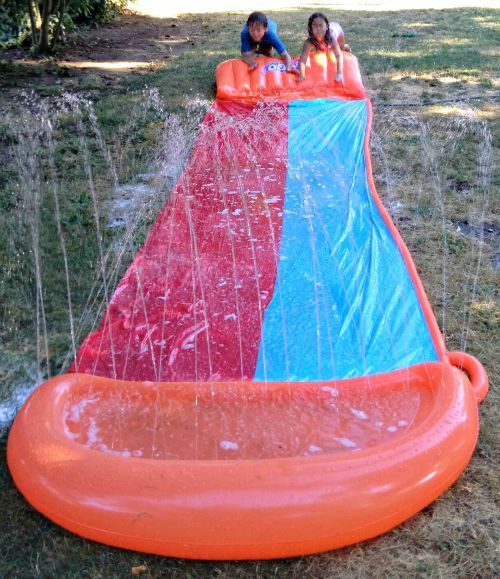 We were sent a couple of the water slides to try. The double was the largest we received, so that is the one I will be showing you. 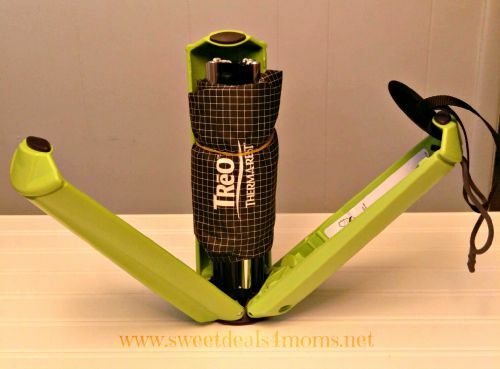 The included hose attachment makes it easy to just snap the hose in instead of twisting. Once the water is turned on, it takes a few minutes to fill up the splash lagoon and get a good water spray going. My kids always want some sort of soap to make it a bit more slippery. (Disclaimer: If you think your kids might get soap in their eyes, please don’t try that!) My kids are toughies so it doesn’t bother them. With my kids ages ranging from pre teen to elementary aged, it’s getting challenging to find them activities they can all agree are fun. 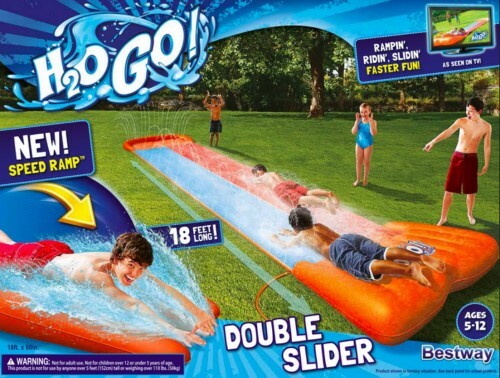 The H20Go double slide was a win all the way around. The kids had fun racing on it as well as taking turns. Buy it: You can find H20Go Slides online or at your favorite retailers. Click here to shop. Do your kids LOVE playing Minecraft? I know all three of mine do. My 12 year old especially has been very interested in not only playing the game, but he was also trying to figure out how to build his own mods. 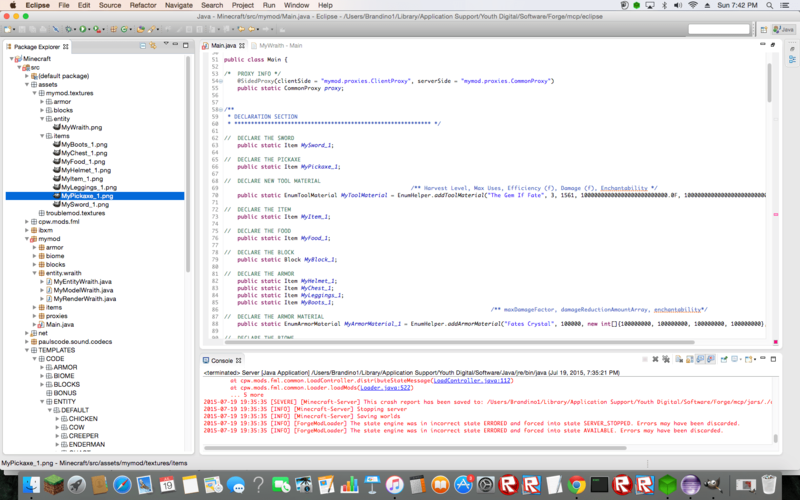 Rather than letting him get swept up in the world of unknown downloads which would more than likely harm his computer, I decided it would be much better for him to try the YouthDigital Mod Design 1 class, which includes everything he needs and is guided in learning to code in Java. You might be wondering, what is a mod exactly? Well, a mod is a modification, to put it in basic terms. They are changes and additions to the Java code that modifies Minecraft’s original game content, allowing someone to alter the gameplay, create new items or experiences, or change how they interact with the Minecraft world. With the class, you get everything you need to learn to mod for one full year, except for the actual game of course. You will need to already have Minecraft installed on your pc or mac. The class includes interactive lessons which are broken down into modules that are taught by an actual teacher via video. We found that the included software was pretty easy to download and includes everything you need to learn. The guided course takes your child step by step through each process and includes one year of online support in case they get stuck. When my son sent a question to support, he was answered pretty quickly. Usually within an hour or two. My son found the class to be very engaging and has been using it off and on through the summer. He has told me that it’s really fun and challenging and he’s always is excited to complete his mod. The teacher is very entertaining and explains to the kids what they need to do in a way that is not boring at all. In a nutshell, for the class you watch videos, respond to questions, earn badges, complete quizzes and assignments. It’s a lot like what you would expect from an actual classroom, but your child can go at their own pace. In the image above, you can see some of what my son has been working on in the main work area. Just click on the image to make it bigger. Here is an example of an item he actually made himself using the class. 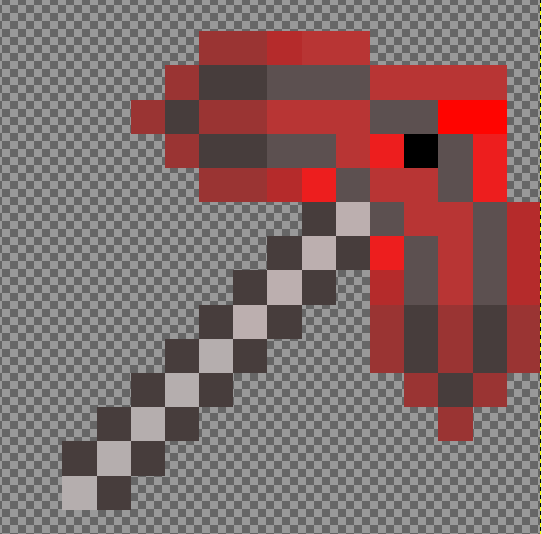 It’s a pick axe as you can see. I really like that my son is taking and enjoying this class. I like that he is learning to code in Java and not just sitting around playing video games. He is actually making things for the game and he feels very accomplished when he makes a new mod. It makes a great summer activity for our down times when we’re not enjoying the outdoors. If the YouthDigital Mod Design 1 sounds like something your child might be interested in, you should give it a try. There is a 30 day, no risk, money back guarantee. They not only offer classes on Minecraft coding, but have other options as well such as, Fashion Design, 3D Animation, Game design and so much more. Go here to check out all of their classes. Who’s excited for this? Each week, there are two family-friendly movies that you can see for only $1 each at Regal Cinemas. Tickets will be available at the box office and all movies start at 10am. A portion of the proceeds goes to the Will Rogers Institute. Most cities start this 9-week program in late May or early June. Thanks to Drugstore Divas for this year’s schedule. You can head over to this link to find your participating theater. 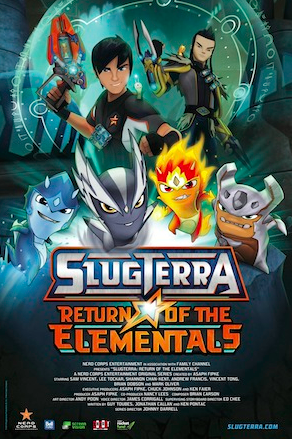 Film Synopsis: In Slugterra: Return of the Elementals, a new member joins the Shane Gang. Junjie is a master of the mysterious slugslinging art of Slug Fu. But even with the power of five slugslingers working together, the Shane Gang find themselves in over their heads as they race to protect the ancient Elemental Slugs from an evil alliance set on using them to destroy the 99 caverns. See a short preview below. We received an advance screening copy of the movie and my kids were thrilled. They were absolutely glued to their seat the whole time they were watching. All three of my kids really enjoyed it. One of my boys said, “I thought it was going to be pretty awesome, and it was.” My daughter is already asking me to buy her Slugterra toys. I should have seen that coming, huh? Go see it: Head over here to find out when and where Slugterra Return of the Elementals is playing near you. Disclosure: I received an advance copy of the movie as part of this review. All opinions stated are my own.